This time when I was in India the very common veggie used by my Amma and Atte was Plantain. I had plantain Palya (Subji), Sambar, Huli, Chips, Stir fry, Kofta, Bhajia and ultimately Plantain Kabab. I know it’s a long list but I never got bored of eating them. Every dish cooked has its own taste and texture. They excel one another in different way. I loved my culinary adventure with this humble yet versatile veggie. Here is a recipe for making Kababs using plantain. Take a pan and heat 2 tbsp of oil. To this add chopped onion, chillies and ginger. Sauté them till onion turn transparent. Add mashed plantain, salt, chopped coriander, corn flour and the entire masalas one after the other and mix well. Switch off the gas and keep the mixture aside to cool down. Take lemon sized balls of mixture and give them a desired shape. Deep fry them in oil till they turn golden brown colour. Serve them hot with tomato ketchup or any sauce/chutney of your choice. Try to avoid adding water while mixing the mixture. The plantain when cooked well has enough moisture to bind all the ingredients together. 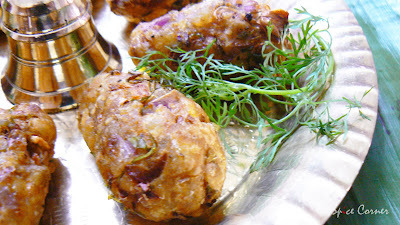 You can coat the kababs with very thin coat of corn flour paste before deep frying. Lovely pictures and a very interesting recipe, Supriya! I'll try it for sure. Love the plantain leaf and the paraphernalia around the kababs! BTW, what is the chutney/ketchup kept in? That is one cool-looking bowl! nice recipe..with plaintain...i do sometimes with potato..
Just love all of your recipes and they are a real treat to my eyes too.... how do you manage to comeup with such wonderful pics.Keep it up.Well i always come to your blog to see them.hee..hee..
its just a plain good old tomato ketchup... thats a bronze plate which is very common at households back in my native. Great recipe, great pics :). I usually make Kofta curry with Plaintain and my Ma makes awesome cutlets. Definitely on my "To Make" list. 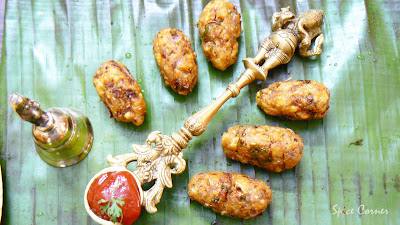 Great pics :) , and agian that Ganesha Spoon is attracting me :P.
thanks for sharing your traditional recipes. :) . I just have a doubt,supriya,donno if its a silly question..Did you use ripe plantains here?And ur pictures and presentaion are gorgeous.. Yesterday i tasted this in my friends house. Lovely presentation. Thanks for sharing. WOW!!!!! simply delicious!!!! Do you use the ripe ones or the raw ones??? I love that spoon of yours!!!! did u like it? i have noticed one thing while making these kabas, that they absorb lot less oil than the potato kababs. annita, i am not able to see ur blog as ur profile dont have ur blog link... can u plz write ur blog link dear? 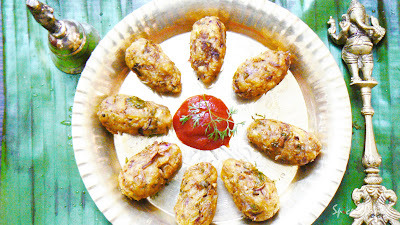 plantain kababs look delicious ! What fabulous pictures!!! Loving that Ganesha spoon...you know, he's my fav.God. :)Can't wait too see your Krishna spoon! Plantain Kababs sound delicious..never made too many things with that yet. Nice presentation as always and I love anything made out of plantain. Yummy recipe with lovely pictures.. I love plantains in any dish palya, koodel-konkani curry coconut sauce, stir fry, deep fry anything. Never used Kitchen king, guess I will this weekend. Really need them on a cold day like this. Nice recipe and thanks for the same. Nice recipe and usual beautifully presented. Was this in India ? 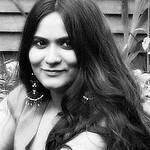 Hi Supriya, Just read ur comment in my blog. Thanx 4 encouraging me. Good idea to use plantain, normally we never think beyond potatoes. Will surely try them. Just saw your comment on my blog,actually the fun was i was commenting in your blog at the same time. Actually we are waiting for our new net connection dear,for time being i use to surf using my mobile, the speed is dead slow...hope everything would be cleared by next week..
looks awesome. Having some plantain. Will try it. You have a nice blog! First time here. You have a commendable collection of recipes, Supriya. Beautiful presentation of a nice recipe. Love the spoon! welcome linda... thanks for ur complements:) do let me know when u give it a try:) happy blogging and happy cooking. Plantain is my favourite veggie.Nice recipe using plantain.The pictures are gorgeous!The spoon-I agree with the others,simply beautiful! hey Sia, Thanks a lot yarr for adding me in your Blog list!! By the way did you get those lovely ornamental spoon from India.oh i fell in love with it.always wanted to have collections like that. 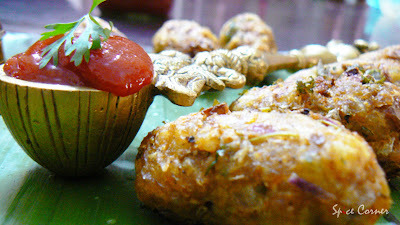 Great pics.. Love your blog ..
Sia - I love plaintains. And now the local american grocery store sells plaintains regularly! Yaay! My favorite is the Plaintain "Phodi" (sliced, coated with red pepper and rice powder and shallow fried!) Yumm. Love that Ganesha "tirth" spoon you have there! Very very nice! Hi Sia...This is something new for me.I will surely try this.And thank you very much for the comment in my blog..Me and my husband always admire your pics.